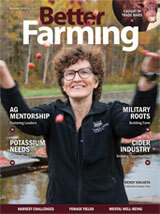 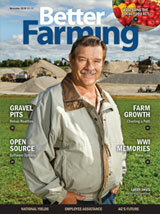 Better Farming December 2018 edition features Wendy Hogarth on the front cover and the following articles: Ag Mentorship - Fostering Leaders, Potassium Needs - Setting Programs, Military Roots - Building Farm, Cider Industry - Growing Opportunities, and Caught in Trade Wars. 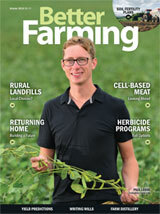 Better Farming October 2018 edition features Paul Legge on the front cover and the following articles: Rural Landfills - Local Choices?, Returning Home - Building a Future, Herbicide Programs - Fall Options, Cell-Based Meat - Looking Ahead, & Soil Fertility Plans. 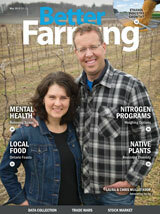 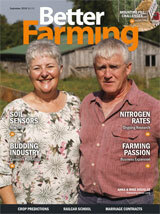 Better Farming September 2018 edition features Anna & Mike Douglas on the front cover and the following articles: Soil Sensors - New Tech, Budding Industry - Cannabis Production, Nitrogen Rates - Ongoing Research, Farming Passion - Business Expansion, and Mounting Fill Challenges.